Roksan K3 DAC review | What Hi-Fi? It’s fair to say Roksan’s K3 range has impressed us so far. We’ve reviewed the integrated amplifier and CD player, and both have earned enthusiastic write-ups. Those expecting the same for the K3 DAC are in for a disappointment. Things start well. The K3 is built into a full-size chassis and is an imposing piece of kit. Physically, it’s as large as a premium integrated amplifier and it possesses a heft few class rivals can match. Put Chord’s dinky 2Qute next to it – the Chord is our current favourite number cruncher at around a grand – and the match up looks comical due to the size disparity. The K3’s build and finish is as good as we’ve come to expect from an established brand such as Roksan. You have a choice of three imaginatively titled options: Anthracite, Charcoal and Opium. Yes, Opium. But it looks classy regardless of the finish chosen. The positive news continues on the features front. There’s a good range of inputs, including a pair of USBs – front and back – and a wireless option. Roksan supplies a USB transmitter in the box, which works in conjunction with the company’s K-Link system. This transmitter plugs into your computer, and once paired with the DAC is claimed to deliver CD quality steaming. While a maximum transmission range of 150m is claimed, Roksan is honest enough to drop this figure to around 30m in a typical house. Pairing appears a simple procedure on paper – just press a button on the DAC and do the same to the one on the transmitter, and off you go. However, our sample took several frustrated attempts before the link was complete, so let’s hope this isn’t typical. The good news is that in use it gives relatively little away to the conventional wired alternatives. Want to use an analogue source? Don’t worry, there’s a dedicated transmitter available for £125. 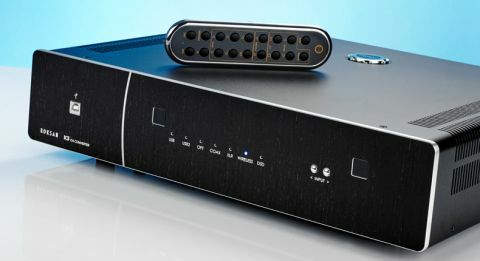 This DAC offers a good choice of analogue outputs too, with two sets of RCAs and a balanced XLR option. Take a look at the specs and the K3 DAC offers most things we’d expect from a product of this type. There’s 24-bit/192kHz compatibility, and the ability to accept both single- and double-speed DSD for those that need it. Most rivals have been configured with a view to the desktop market (such as Naim’s DAC-V1 and Chord Hugo) and so include headphone outputs (not to mention a volume control), but Roksan look to be pitching the K3 as a pure hi-fi product in the traditional mould. There’s nothing wrong with that, though it puts the K3 right up against Chord’s other over-achiever, the 2Qute, which is available for £995. We start off with the K3’s coax input using our resident Naim NDS/555PS streamer and a Cyrus’s CDi CD player as sources. The results are likeable. The Roksan paints on a large canvas, rendering a large-scale sound that brims with authority. Hans Zimmer’s Interstellar comes through with power and plenty of low-end heft. There’s a nice, wide-open sound stage and a pleasing degree of stability to the position of instruments. We like the way the way this DAC layers the sound too – it’s done with care and precision. Detail levels are pretty good, and all that information is organised well. The K3’s presentation exudes an air of confidence and never sounds stressed, even when the music becomes complex. There’s a no shortage of authority here, like other products in the K3 range, the DAC sounds broad shouldered and muscular. This presentation stays consistent through all the inputs – 2 x USB, a coax, optical and AES3 – that’s not always the case. Our resident MacBook Air (loaded with Pure Music media software) proves a good match, and we enjoy everything from Stevie Wonder’s Innervisions right the way through to Kind of Blue from Miles Davis. Tonally, things are fine, with a broadly balanced sound that captures the timbre of instruments well. Rhythmically things are tidy, though it is lacking the Chord 2Qute’s innate ability to communicate the ebb and flow of a piece of music well. It’s the sheer quality of the Chord (and to a lesser extent the Naim DAC-V1) that really stops the K3 DAC from earning a recommendation. In isolation the Roksan is a solid performer, but once the Chord comes into the picture there are obvious shortfalls in resolution, dynamic expression and ability to convey rhythms. The Roksan counters with a wider range of inputs and sheer rack presence. But that’s not enough. It’s fair to say we’re disappointed. The K3 DAC is a decent enough product but it’s up against some massively talented competition. And let’s not forget the significant price difference too.